Christiane Taubira is an economist, politician, and writer who was born on February 2, 1952 in Cayenne, Guyana. Founding president of the Guyanese Walwari Party, she is also an author of a number of writings on the topic of slavery and political equality. In May 2012 Taubira was appointed Minister of Justice of France in the Ayrault government under President François Hollande. 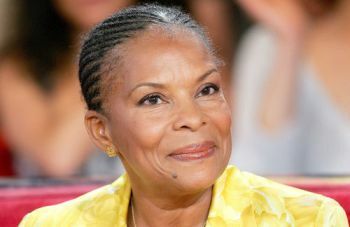 Taubira, who is divorced and a mother of four, is one of six children of a single mother who worked as a nurse’s aide. In 1978 she became an economics professor and from 1982 until 1985 she served as the director of Caricoop (Caribbean Confederation of Agricultural Cooperation), an organization that she founded. In 1993 Taubira was elected to the French National Assembly as the representative from Guyana and was reelected in 1997, 2002, and 2005. In 1994 she became a member of the European Parliament. In addition to her legislative work, in 2002 Taubira was the first person from the French Caribbean, as well as the first woman and the first person of color, to become a presidential candidate in France. One of the principal points of Taubira’s political program is the need for government to address the concerns of people of color, women, and others who have been excluded from the mainstream political systems. She has been called a “free electron” in politics because of her sometimes independent stances apart from party politics. In 2001 Taubira was the principal author of the Taubira Law, which recognized the slave trade as a crime against humanity. Under this legislation the French government expressly recognized the dehumanizing impact of the transatlantic and Indian Ocean black slave trade and slavery that were practiced from the 15th century in the Americas, the Caribbean, the Indian Ocean, and Europe on African, Amerindian, Malagasy, and Indian populations. It declared the slave trade a crime against humanity. The Taubira Law requires school curricula and research projects in the fields of history and the social science to accord to the subjects of the black slave trade and slavery “the important place they deserve.” The law also further calls for “sites and actions” that will guarantee the perpetuation of the memory of this crime to future generations. Some of Taubira’s most recent books address the place of blacks in French history and society. In L’Esclavage raconté à ma fille (Slavery Explained to My Daughter), Taubira discusses the history of French enslavement of Africans and their descendants and describes the moral, social, economic, and political effects of slavery that persist among the descendants of enslaved people. In Égalité pour les exclus: le politique face à l’histoire et à la mémoire colonials [Equality for the Excluded: Politics in View of Colonial History and Memory] Taubira considers the extent to which French politics takes into account French colonial history. In Mes météores: Combats politiques au long cours [My Meteors: Political Combat Over the Long Term], Taubira detailed her political journey. John Gaffney, The French Legislative and Presidential Elections of 2002 (Burlington, Vermont: Ashgate, 2004); Christiane Taubira, Mes météores: Combats politiques au long cours [My Meteors: Politics in the Long Term] (Paris: Flammarion, 2012); Christiane Taubira-Delannon, Égalité pour les exclus: le politique face à l'histoire et à la mémoire colonials [Equality for the Excluded: Politics in View of Colonial History and Memory] (Paris: Temps Présent, 2009). Memory] (Paris: Temps Présent, 2009).